The art market is the result of complex interactions. The purpose of this research is to analyze the relations among actors of the contemporary art system, in particular considering the production of contemporary art exhibitions. 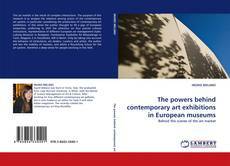 In this sense the author thought to fill a gap of European researches, preferring to shift the attention on four precise cultural institutions, representative of different European art management styles: Ludwig Museum in Budapest, Fondazione Sandretto Re Rebaudengo in Turin, Magasin 3 in Stockholm, KW in Berlin. Only by taking into account the behavior of institutions, art dealers, curators and artists, the author will test the stability of markets, and admit a flourishing future for the art system, therefore a deep sense for people working in this field.